Amazing news has spread across the Scottish countryside. The most famous of highland bachelors, police sergeant Hamish Macbeth, will be married at last. Everyone in the village of Lochdubh adores Josie McSween, Macbeth's newest constable and blushing bride-to-be. While locals think Josie is quite a catch, Hamish has a case of prenuptial jitters. After all, if it weren't for the recent murder of a beautiful woman in a neighbouring village, there wouldn't be a wedding at all. 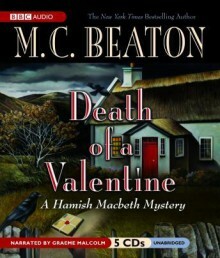 For it was a mysterious Valentine's Day package--delivered to the victim before her death--that initially drew Hamish and Josie together on the investigation. As they work side by side, Hamish and Josie soon discover that the woman's list of admirers was endless, confirming Hamish's suspicion that love can be blind, deaf . . . and deadly. When it comes to mysteries, I am pretty easy to please. And I usually find M.C. Beaton to be a quick and enjoyable read. However, the last few books I've read (both in this serious, and the Agatha Raisin series), I found myself getting irritated, simply because her characters never change!